ACQUA rotational ceiling fan, textured brushed nickel, 2 motor heads with 3 mahogany finish wooden blades each, 3 speeds, remote control, for indoors and outdoors (damp location). 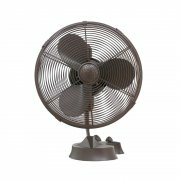 Show piece with full warranty for a special price..
CINNI Design desktop fan, textured bronze, 3 fan speeds - non-reversing, oscillates 90°. DIANE oscillating directional ceiling fan, textured bronze finish, motor with 3 mahogany wood blades, 3 speeds plus oscillation separately operated by included wall control, for indoors and outdoors (damp location). DIANE oscillating directional ceiling fan, brushed nickel finish, motor with 3 mahogany wooden blades, 3 speeds plus oscillation separately operated by included wall control, for indoors and outdoors (damp location). DIANE oscillating directional ceiling fan, brushed nickel finish, motor with 3 metal blades, 3 speeds plus oscillation separately operated by included wall control, for indoors and outdoors (damp location). 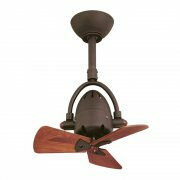 Outdoor ceiling fan Donaire Ø 132 cm constructed of entirely 316 marine grade stainless steel, brushed bronze finish, 3 ABS plastic blades, forward and reverse, 3 speeds operated by included remote control, integrated dimmable 16W LED light kit with optional metal cover, for indoors and outdoors (WET locations, which means that you can install it outdoors in uncovered or partially covered areas which could be surprised by a rain shower). 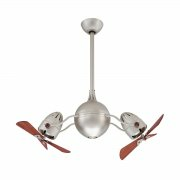 Outdoor ceiling fan Donaire Ø 132 cm constructed of entirely 316 marine grade stainless steel, brushed stainless finish, 3 ABS plastic blades, forward and reverse, 3 speeds operated by included remote control, integrated dimmable 16W LED light kit with optional metal cover, for indoors and outdoors (WET locations, which means that you can install it outdoors in uncovered or partially covered areas which could be surprised by a rain shower). 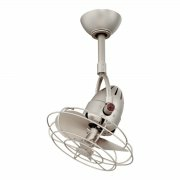 ELIZA DC-ceiling fan, white finish, energy-efficient DC motor with 3 gray ash finish plastic blades, 6 speeds forward and reverse, operated by included remote control, for indoors and outdoors (wet location). ELIZA DC-ceiling fan, white finish, energy-efficient DC motor with 3 walnut finish plastic blades, 6 speeds forward and reverse, operated by included remote control, for indoors and outdoors (wet location). ELIZA DC-ceiling fan, white finish, energy-efficient DC motor with 3 white finish plastic blades, 6 speeds forward and reverse, operated by included remote control, for indoors and outdoors (damp location). IRENE Hugger ceiling fan, textured bronze finish, energy-efficient DC motor with 5 walnut finish wooden blades, 6 speeds forward and reverse, operated by included remote control, for indoors and outdoors (damp location). 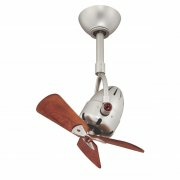 IRENE Hugger ceiling fan, brushed nickel finish, energy-efficient DC motor with 5 walnut finish wooden blades, 6 speeds forward and reverse, operated by included remote control, for indoors and outdoors (damp location). IRENE Hugger ceiling fan, black finish, energy-efficient DC motor with 5 walnut finish wooden blades, 6 speeds forward and reverse, operated by included remote control, for indoors and outdoors (damp location). IRENE Hugger ceiling fan, white finish, energy-efficient DC motor with 5 walnut finish wooden blades, 6 speeds forward and reverse, operated by included remote control, for indoors and outdoors (damp location).